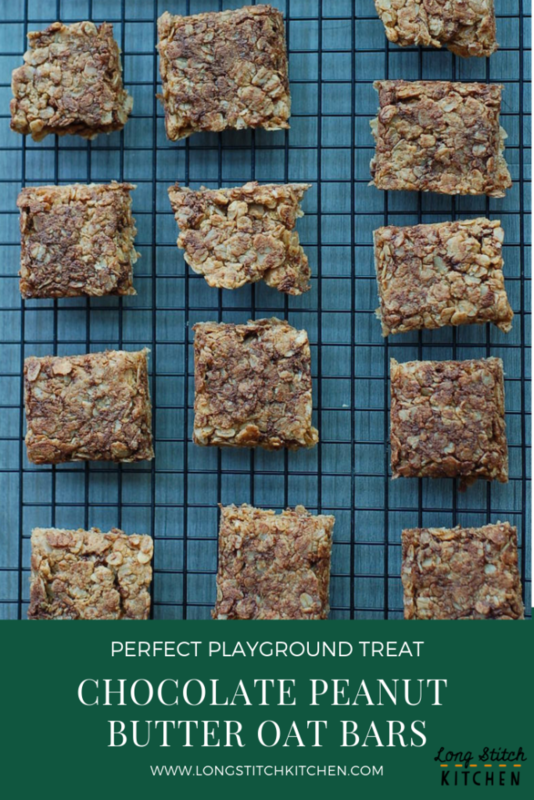 Spring is upon us, which means that in our household, we are in constant need of easy, hand-held treats that I can throw in a tin and bring to the playground. I’ve sworn off singly-wrapped snacks to avoid the waste; this makes that Costco membership feel a little less useful, but makes me feel better about what we’re tossing in the bin. 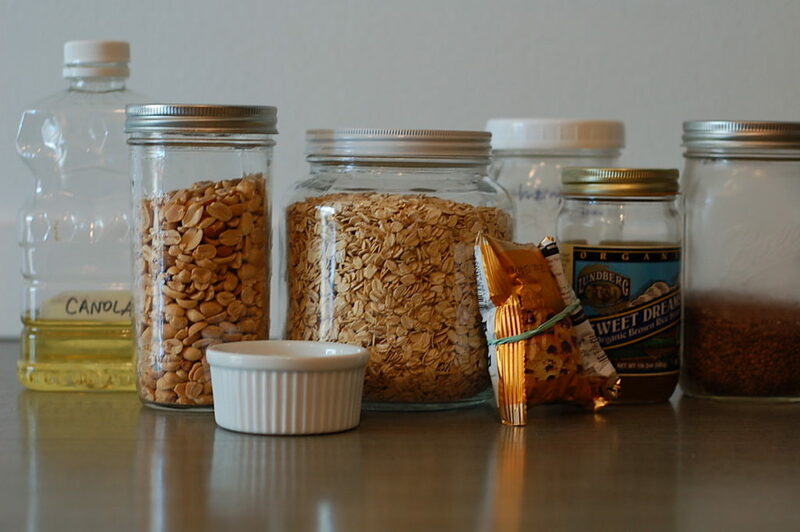 We pack fruit, sure, and slices of cheese, and hummus and veggie sticks, and other virtuous things, but sometimes my kids really just need the calories and heft of a granola bar, and I need the convenience of zero prep when we are walking out the door. 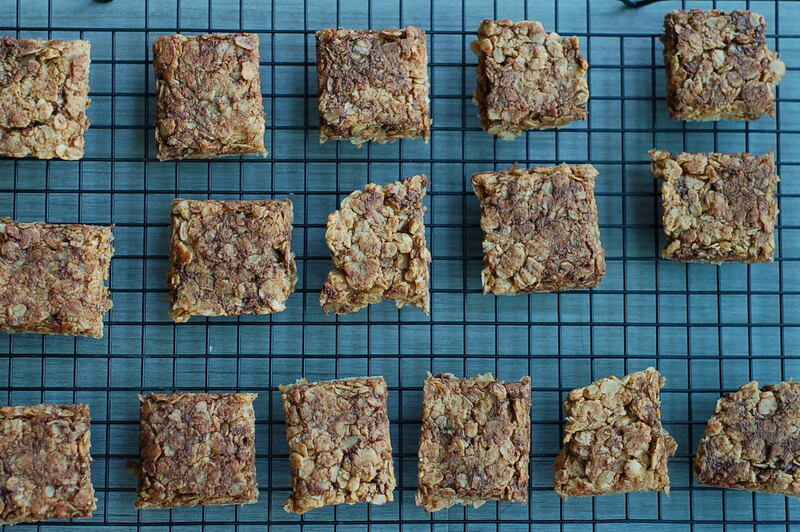 I’ve been making my version of oatmeal cookie Z-bars, and my kids love them, but I wanted to expand my repertoire. 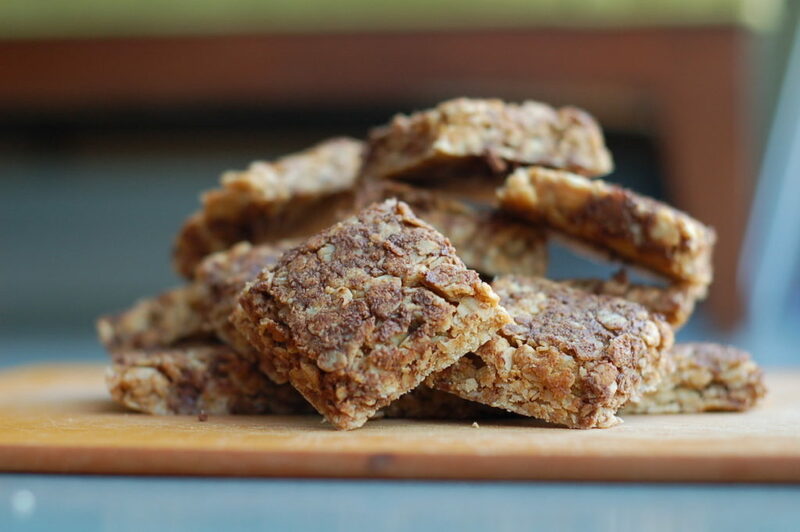 I made a lot of granola bars back before my second kiddo was born, and I would pack them absolutely to the brim with healthy additions, often to the point where my oldest would take a few bites and abandon the rest. 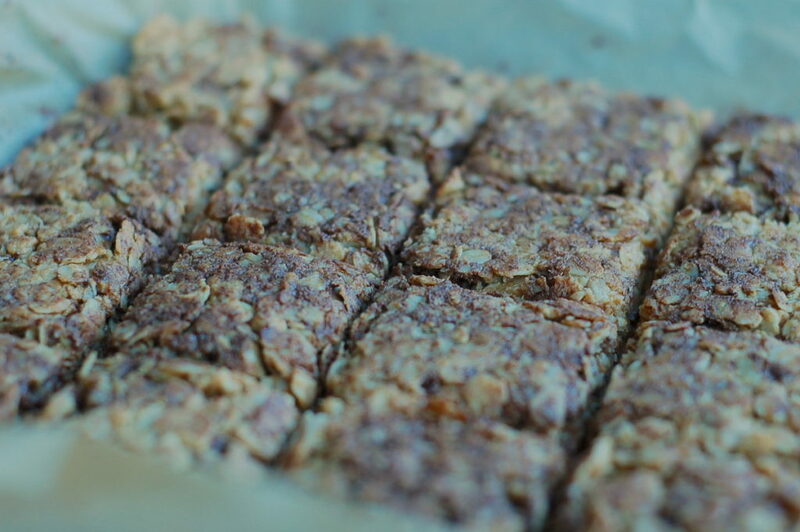 And so I sort of abandoned the making of granola bars until fairly recently. The one thing I kept from those granola bar making days? The incredible usefulness of brown rice syrup. I learned about this from Emma Christiansen on the Kitchn, and the difference is quite something. I wanted to make something that my kids would actually eat, that would have enough healthy stuff to not feel like junk food, and that would provide enough fuel to get through rock climbing class or parkour practice. So I settled on the idea of a peanut butter chocolate combo, because what is better than a peanut butter chocolate combo? I did some research online and came upon a recipe from this blog Bites for Foodies that sounded pretty promising. I made a few tweaks, and these are total winners in our house. We inhaled the first batch in about two days. The second in a few days more. Now it’s in regular rotation. Lots of wholesome going into these. 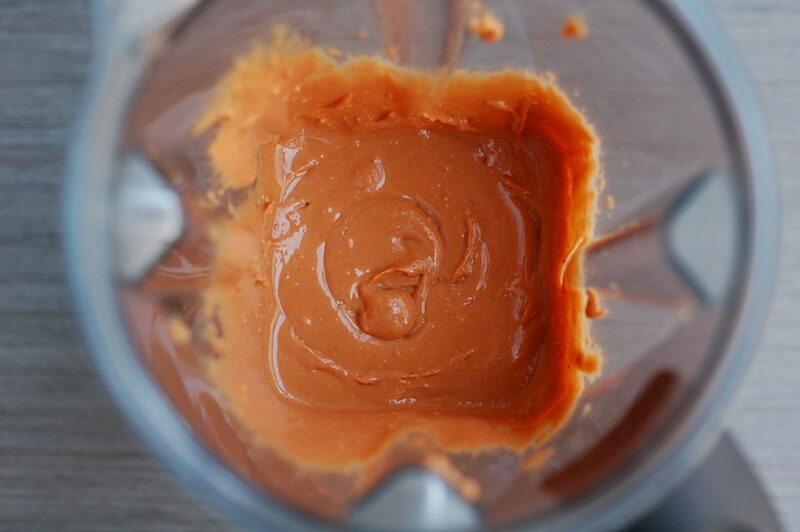 If you’ve never made your own peanut butter, it is so worth your time. Heating the peanut butter, oil, and sweetener makes it so much easier to combine. It’s worth the extra dish, I swear. Try not to eat it yet. 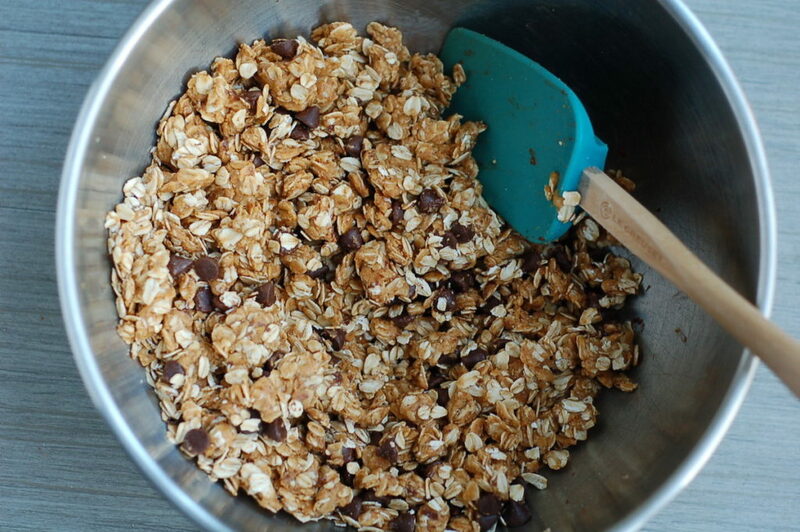 Mix it thoroughly; you want those oats to all get some stickiness on them. Before (and after!) baking, really compress the bars with the back of a sturdy spatula. It evens them out and helps them hold together. Note: I often make these right after I’ve made a batch of fresh peanut butter in my Vitamix. I simply grind unsalted, dry-roasted peanuts (from the bulk section of my grocery store) in my Vitamix. Start slow, with about a cup of peanuts and very slowly – using the tamper the whole time – crank up the speed until it is on high. Then add more peanuts. I grind about 2.5 cups of peanuts at a time, which makes more than enough peanut butter for this recipe plus a jar leftover. Heat your oven to 350°F. I use our toaster oven. Line an 8″x8″ oven-proof pan with parchment paper and set aside. 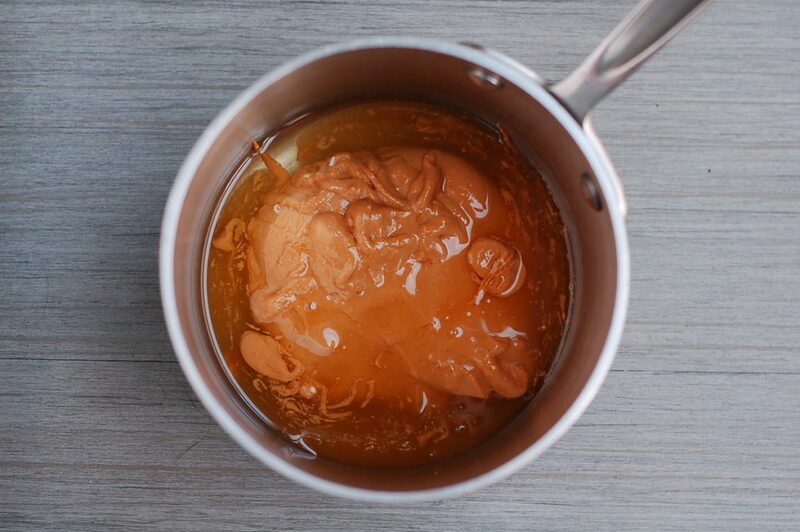 Combine the peanut butter (either what you’ve made or a natural peanut butter you’ve bought), brown rice syrup, and oil in a small sauce pan and heat over low heat. You want it to warm enough that it easily combines. In a spice grinder, grind the flax seed, or use ground flaxseed if you can’t be bothered! In a large bowl, combing the oats, ground flax seed, baking soda, and salt. Stir to combine. While it is warming on the stovetop, occasionally stir the peanut butter mixture until it is uniform, very smooth, and pourable. 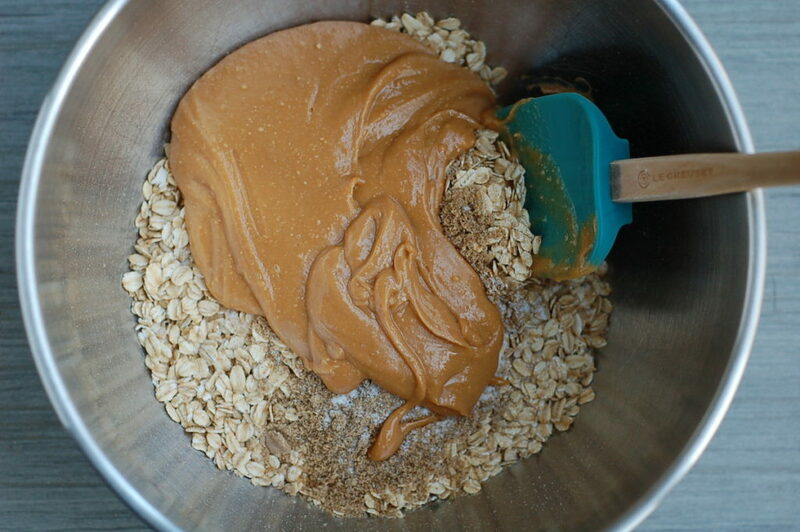 Pour the peanut butter mixture into the large bowl with the oats, and stir thoroughly to combine. Add the chocolate chips and stir to combine. 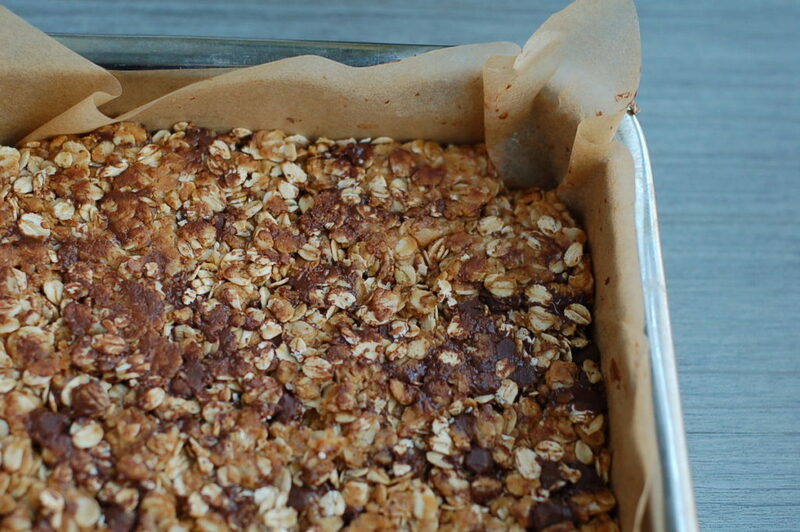 It is helpful if you let this sit for a few minutes, as the oats soften and hold together better after baking. Pour the mixture into your prepared pan. Use the back of a spatula to firmly and levelly press the mixture into the pan. Remove from the oven and place on a cooling rack. Allow to cool for a minute or two, and then compress the bars again, carefully, with the back of a spatula. Let cool for about 5 minutes more, then remove the parchment and bars carefully from the pan and place on a cutting board. Cut into 16 bars with a sharp knife; it’s important to do this before they cool too much or they will crumble more than you might like. Return the sliced bars to the cooling rack and allow to cool completely before transferring to an airtight container and gobbling them all up.